14" Heated Bird Bath Dish Insert. Fits any 14" Bird bath Ring. This unit is designed for use on our clamp, pole, screw or ground level bath support rings. The unit is not recommended for placement in large bird bath bowls which may fill with water, or on the ground. Possible water seepage will damage the product, and void the one year warranty. Some icing on the surface of the water is normal when temperatures are extremely low, especially if there is a breeze. Your birdbath is not defective if ice begins to form around the rim. It features a 60 watt heating element, and it's thermostatically controlled. Heated Bird Bath dish is 14” in diameter and 1-1/4" Deep. Holds over 3/4 of a gallon of water. One year warranty! This Heated Bird Bath is assembled in the USA at our factory in Chicago. The thermostat and heating element are manufactured off shore. All other Heated Bird Bath components including the flame retardant black dish, 16 Gauge three prong grounded electrical cord (8" Long), insulation and the metal ring are made in the USA. You have reached the actual manufacturer's website. If you purchase your Heated Bird Bath at this site, we can address any warranty issues and answer questions regarding your particular unit, quickly. 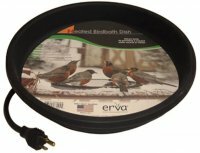 All Erva Heated Bird Baths are made with material certified as flame retardant and BPA free. Our Heated Bird Baths might cost a little more because we use only flame retardant material. Erva Heated Bird Baths also offer fully insulated heating elements which send heat directly upwards, conserving energy. Full insulation also prevents condensation within the Heated Bird Bath which can corrode the electrical contacts rendering the product inoperable. Whichever Heated Bird Bath you choose, be sure to verify that it has been produced with flame retardant materials.